Not all of us have acres of space, a paddock or even a field for our hens to cavort, promenade or scratch around. Some of us, myself included only have our back garden for our chickens to stretch their feathers in and when that is the case you need a small practical coop that isn't going to take up too much room while still providing space enough to swing a cat, should your chickens want too. 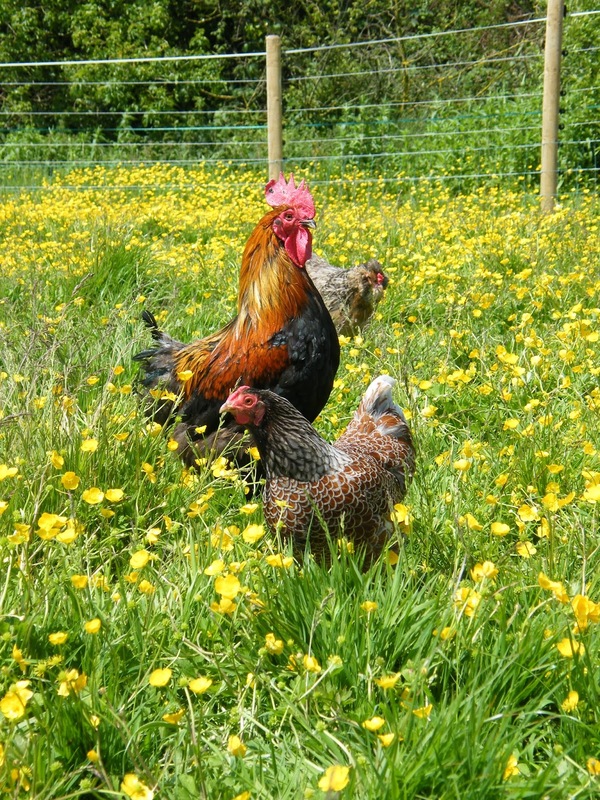 A small flock of three hens can still provide plenty of garden entertainment and pleasure as pets as well as enough eggs to keep the cupboard well stocked for breakfast soldiers, lunchtime omelettes and dinnertime quiche. 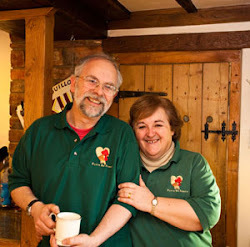 With a small flock you only need a small coop and after many requests for a small coop for the back garden chicken keeper the Boss Phill designed the Annie's Coop, which has proved popular with hen keepers with an economy of space year after year. With raised maisonette living for three medium sized birds, the inside of the coop has both removable perches and a separate nest box with privacy wall, to provide luxuriant living. The staircase leading up to the living quarters also doubles up as the door, so when the door is up, your girls are safe and sound for the evening. 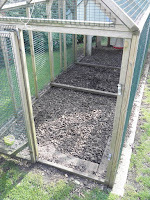 Underneath the house is a sheltered area for your hens to take refuge from the rain or sunshine. it makes an equally good spot for feeders and drinkers, keeping them safe from the elements. Access into the coop is through a large hinged door at the back, which when it comes to the weekly clean, allows you to get right into the coop and clean it out. Should you wish at a later date to keep your girls a little more enclosed and not give them free reign of the garden flowerbeds, then an additional run to the front of the coop is just the ticket. Coming in either a 6ft or 9ft long option, the runs fit snugly onto the front of the coop. Made from 19 gauge inch by half inch European weldmesh on solid timber framing, the runs are both strong and secure and will prevent foxes, badgers and any other predators from breaking in to your girls. 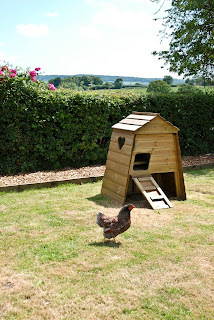 A small chicken coop like this allows more and more of us to have a few hens strolling around the garden and its compact, cleverly designed nature means it is ideal for the urban garden or cottage garden alike. 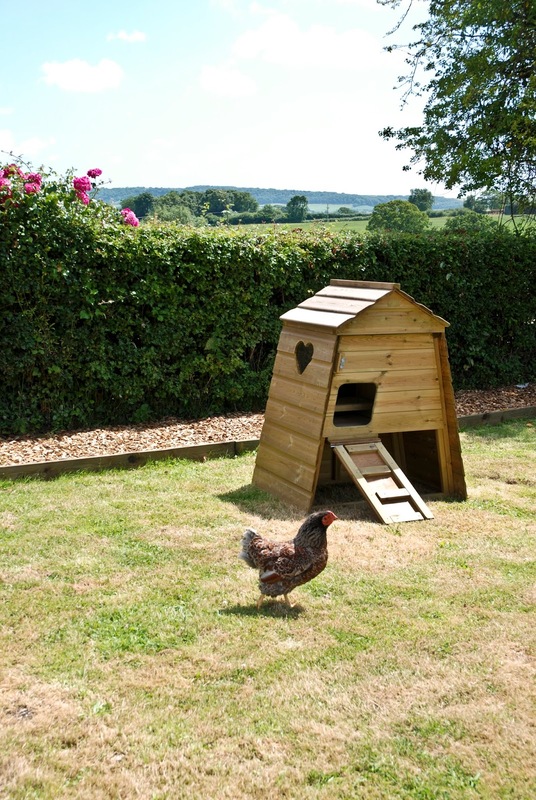 Made from Scandinavian Redwood (that has been pressure treated with Tanalith-E to put it good against fungus and rot for up to fifteen years) of joinery grade quality, the hen house will last in your garden for many years. Equally the ramp / door is produced from high quality plywood, that is strong enough to take the daily climb to and from bed. The fixtures and fittings on the coop are made from galvanised metal of the highest quality and in conjunction with the high quality timber, make this a durable but charming little chicken coop. If you have any questions about our smaller chicken coops, or one of our hen houses in general, why not leave a comment below or phone 01300 345229 to speak to a member of the Flyte So Fancy team. We're all on a bit of a health drive here at Flyte so Fancy HQ. Gone are the biscuits and cakes to be replaced with fruits, while lunchtimes now consist of fresh salads and home-made soups. I'm sure it wont be long before we start a company wide morning Tai Chi session, or a Wake-n-Shake warm up like they do at the local Primary School. We aren't the only ones getting in shape however, with the FSF flock ready to drop the winter weight, stretch their tail feathers and get fit. Luckily the chickens in the field have several of our Flyte so Fancy Chicken Jungle Gyms set up to help with their new drive health drive. The Chicken Jungle Gym is perfect for hens looking for entertainment, exercise or merely somewhere just to perch and pass the time. The Jungle Gym comes with everything a chicken needs, ramps and ladders for climbing with multi-level perches so a hen can have a rest after all the strenuous exercising. The Jungle Gym also comes with hanging points for treats and feeders (perhaps somewhat defeating the point of all this exercise) to help keep your flock happy and feeling tip-top. Finally the little roof on top will keep the rain from your hens backs and the sun from their heads. 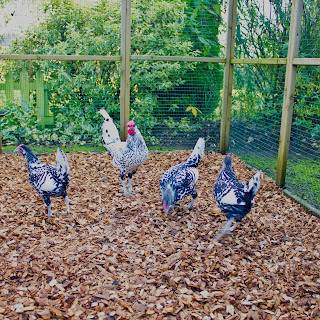 Made from our usual pressure treated timbers and incredibly sturdy to stand up to years of use by all manner of hens, the Flyte so Fancy flock absolutely love it and can often be seen climbing all over it. In fact if you visit the shop, you will regularly see our Gold Hamburg cockerel sat on the roof of one in our display area, with his ladies perched around him. 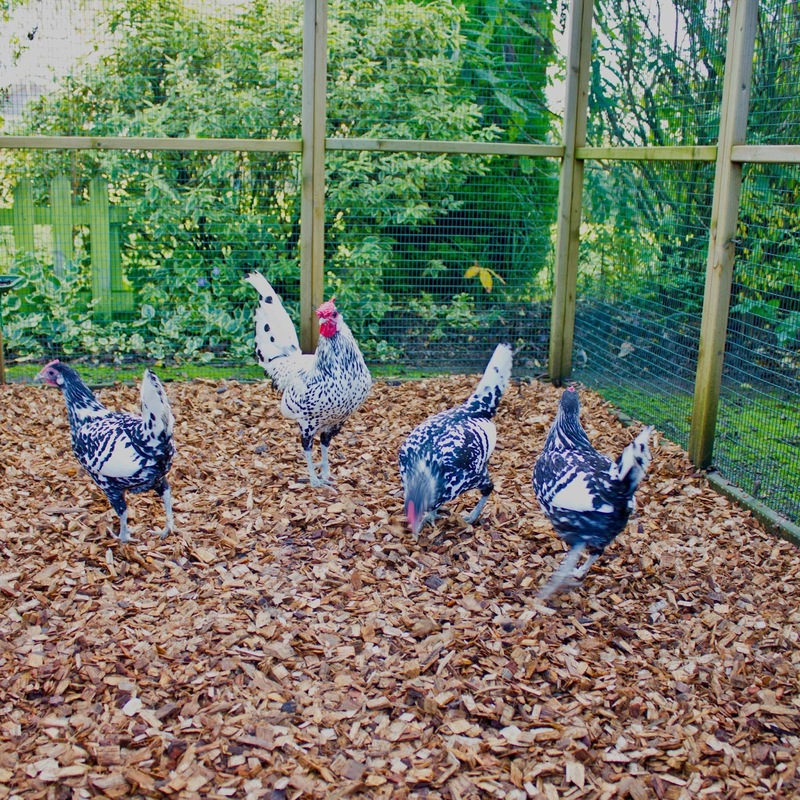 The Chicken Jungle Gym is great for paddocks and also for Poultry Protection Pens, as it provides something for chickens to do, climbing, perching and exploring, everything a chicken loves to do. Plus with our current health kick (not sure how much longer that will last. Biscuits are calling to me) it helps to keep all members of the FSF Team looking trim and fit. If you have any questions about our chicken perch and activity centres you can leave a question below or call us 01300 345229 to talk to a member of the Flyte so Fancy Team. The ducks that live on the FSF pond are a particular favourite of mine. From the Cayuga / Cherry Valley crosses that hatched out last year, to our old Saxony mallard, there is something about their mocking quacks and waddling shuffles, that I find most endearing. Recently we have had a lot of calls from people looking to add a few ducks to their back garden flock. They are however very different from chickens and have a few differing requirements to keep them happy and quacking away. Ducks have great character and are very amusing to watch. Most breads only require a small amount of water to be happy. Certain breeds of duck are prolific egg layers, laying right through the winter months. Ducks tend not to suffer red mite. There feathers are too thick and oiled to attract the chicken pest. Excellent destroyer of garden pests like slugs and bugs. They will lay eggs anywhere. Ducks are messy. If kept in an area of your garden they will turn it to mud. Ducks require plenty of fresh water for cleaning and bathing. You have to regularly change this water to avoid disease. Certain breeds of ducks can be very noisy, i.e Call Ducks. One of the most popular Duck Houses, that we make here in the Flyte so Fancy workshop, is the Puddleduck Duck House. Made from our high quality Scandinavian Redwood timber they are durable enough to stand up to a ducks messy life style, while looking charming and natural within a garden or by a pond. The Puddleduck Duck House is ideal for people looking to add one or two waterfowl to the family. 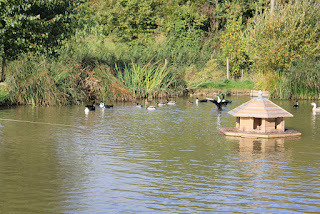 It suits Call Ducks and Ornamental Ducks or Mallards, whilst the large Puddleduck Duck House will house two Aylesbury-size ducks or two Indian Runners. With a large entrance door on the front, the access ramp also doubles up as a predator proof door once shut. The hinged roof of the Puddleduck also allows access right into the house, making cleaning incredibly easy. 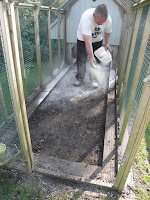 Being messier than the average chicken, you will want to make sure you put down a thicker layer of bedding for ducks, remember they do not perch like a chicken would. The Puddleduck Duck House also comes with ventilation grills in the back. 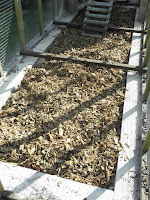 Not minding if they track mud in with them, as well as other mess, a duck house requires good solid ventilation. Like chickens, you should never keep just one duck and certain breeds are good layers, providing a good quantity of eggs all year around. Ducks require water for cleaning themselves, especially for dunking their heads so they can wash their eyes and there are specific feeds for waterfowl available (although ours here at Flyte so Fancy are quite happy to eat Layers Pellets with the hens). Keeping a few ducks can be a great addition to a flock and they have such wonderful laid back characters, that you will quickly become a favourite, just like the FSF ducks are to me. 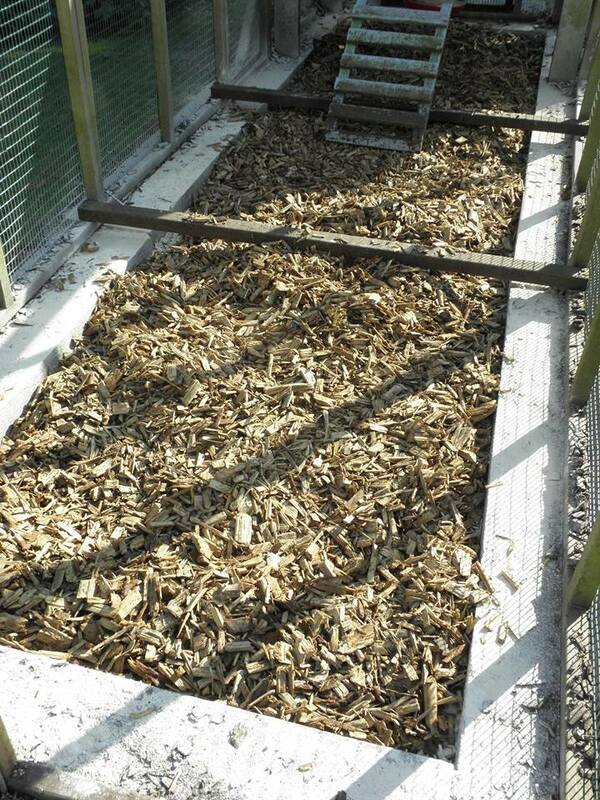 If you have any questions about duck housing or the things you'll need for keeping ducks, please leave a comment below or call us on 01300 345229 to talk to a member of the FSF team. Over the last few weeks we've had several phone calls from people asking about poultry worms and the best way to deal with them. Poultry worms should be treated as "one of those things" that can happen when you are keeping chickens. 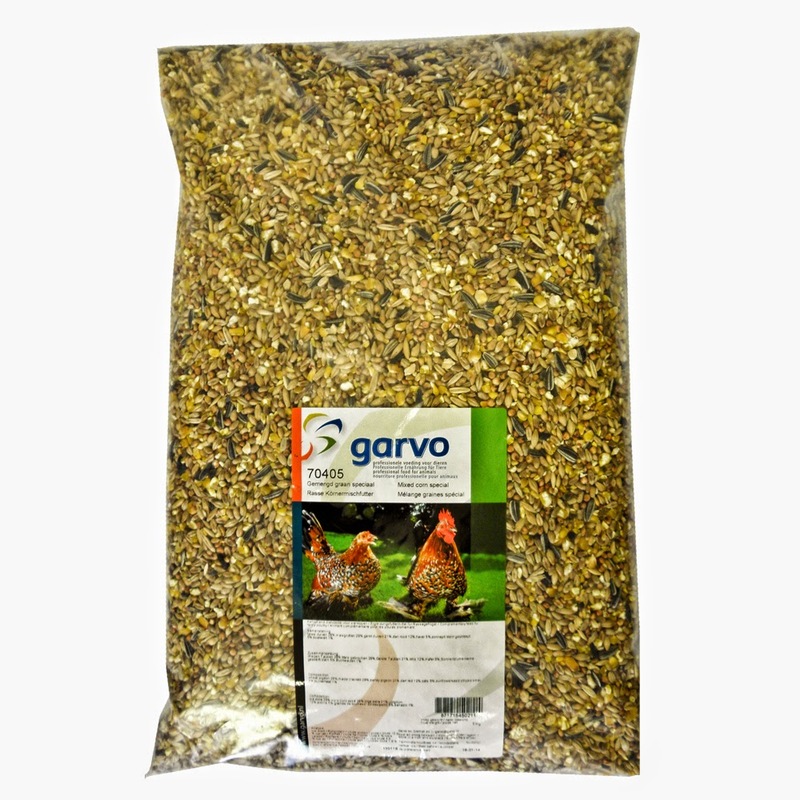 Poultry worms will of course affect the health of your bird, and you might witness them loosing weight due to the worm stealing all their nutrients, a drop in egg production or general listlessness. If you suspect that your flock is suffering from worms then your first port of call should be a licensed wormer such as Flubenvet 1%. Flubenvet is a licensed product designed for the small poultry flock keeper. 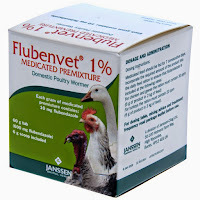 Available in a 60g pack, Flubenvet 1% will treat around twenty birds for a seven day period. 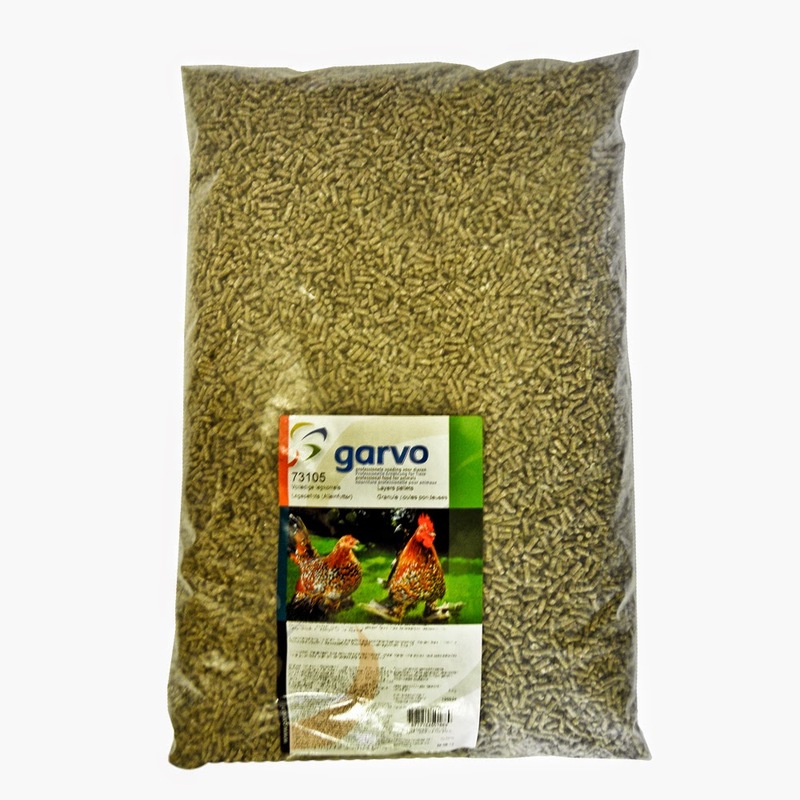 It effectively kills all stages of worms common to poultry, and has the added advantage of suffering no egg withdrawal period, both during and after treatment. Flubenvet can be prescribed by a vet or a specially qualified person so if you suspect that your girls have worms you should use Flubenvet straight away. 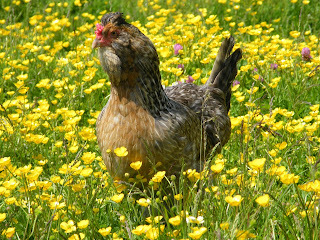 Otherwise it can be a good idea to give your chickens a dose at the beginning of spring and then autumn to help kill off any worms your girls might have picked up. 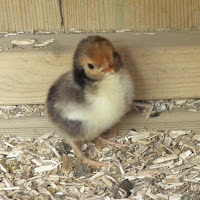 For more information on Flubenvet 1% CLICK HERE to view what PoultryKeeper.com have to say. 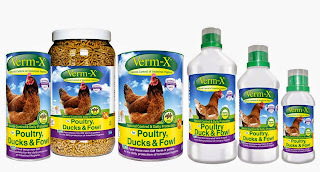 There is also a herbal answer to the question of poultry worms, Verm-X for Poultry. As it contains no chemicals, it requires no license to be purchased and as such cannot label itself as a poultry "wormer". 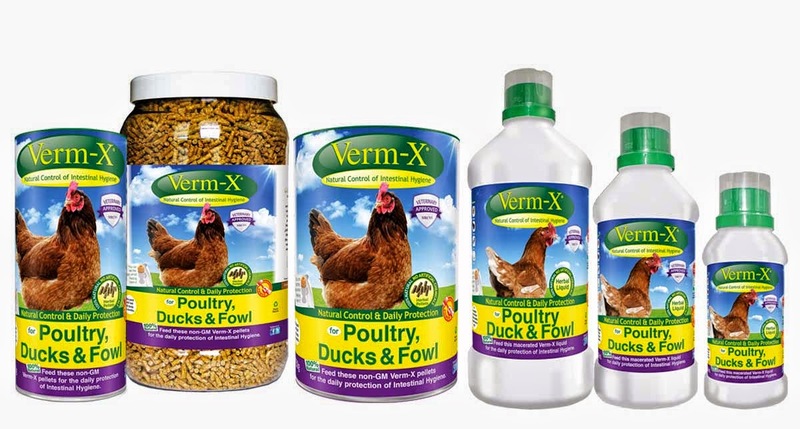 However, with continual use throughout the year, Verm-X helps promote a healthy gut inhospitable to poultry worms. 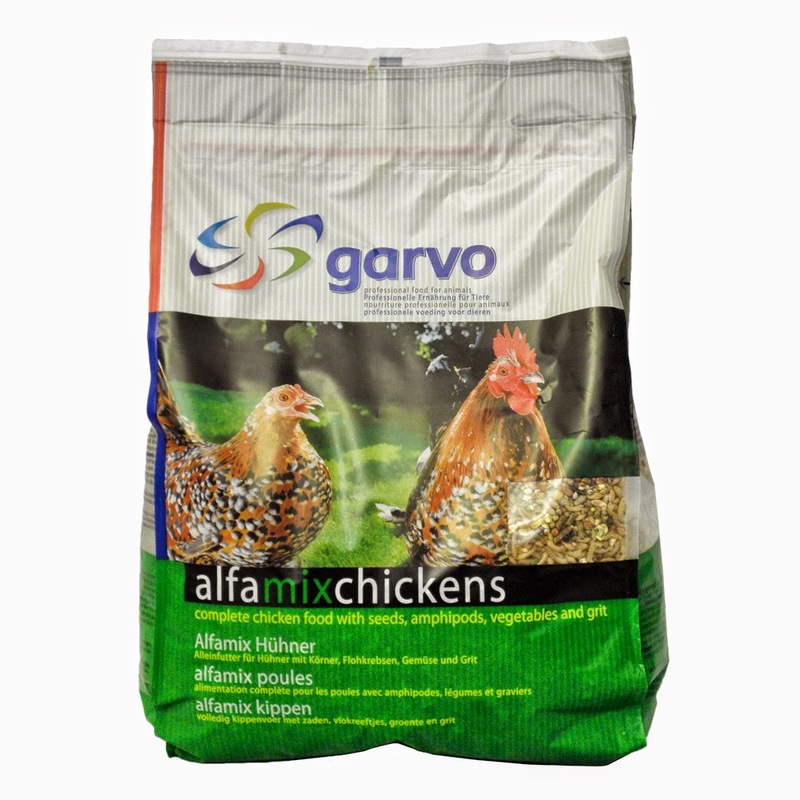 As it is a 100% natural formula there is no egg withdrawal period and is merely applied to your hens feed or water for three days each month. Verm-X comes in both a pellet form for adding to feed or a liquid supplement to put into drinkers. Both are equally effective, but I must admit a preference for the liquid version, as I never quite trust my greedy girls not to just eat around the Verm-X Pellets, in their quest to stuff their beaks. If you are looking to worm as a treatment, then you will want to use Flubenvet 1% in the spring and autumn, however as a prevention, you could use the Verm-X on a monthly basis. A helpful addition to your shelf might also be a ground sanitising powder, perfect for killing off those worm eggs and larvae before they can become a problem. For more information on identifying the most common worms to affect poultry have a look at our info page on Poultry Worms - Treat and Prevent. Or if you have a question why not leave a comment below or call 01300 345229 to speak to a member of our team. If you flipped a coin it's a 50/50 chance you would guess correctly on what face the coin would fall. Equally if you keep chickens chances are sooner or later you will come into contact with Coccidiosis. Coccidiosis is a disease caused by a coccidial oocyst, a microscopic parasite that when digested by the bird, attaches itself to the lining of the gut where it begins feeding, causing the chicken to bleed. Once a bird is infected, it will pass these parasites through its droppings where it can be picked up by other members of the flock. But do not worry, the purpose of this blog is to help you identify a bird that may have been infected and then cure them. Contaminated ground through transfer or natural occurrence. Dirty water, wet or damp bedding and areas around drinkers are especially prone. Exposure through the droppings of another bird. The bird is passing blood in their poo, this is from the oocyst attacking the gut lining. Listless chickens, droopy and hunched over, with ruffled feathers. Young birds are more prone to the infection and will die if not quickly treated. 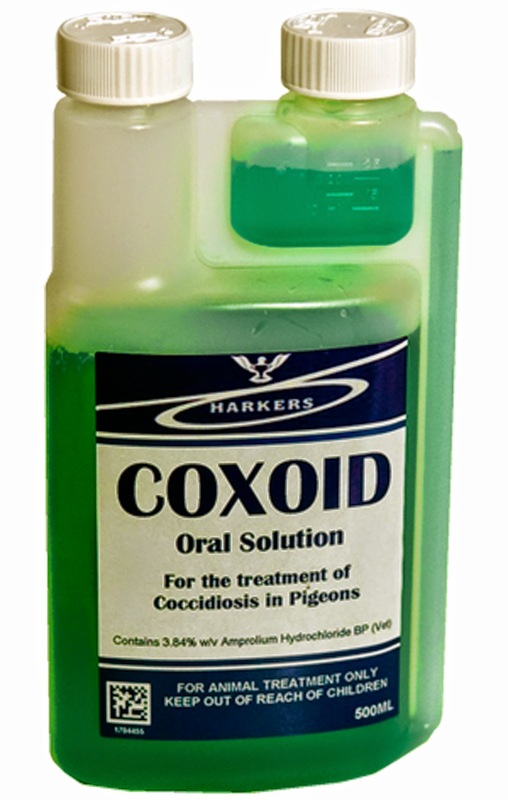 Coxoid is a liquid treatment for pigeons that has been found to be effective in poultry. Put into their drinking water over 7 days at a rate of 28ml per 4.5 litres of water. This is powerful stuff and has a 28 day egg withdrawal period that should be followed. A coccidial disinfectant, like Bi-OO-Cyst, should be used for cleaning the house. 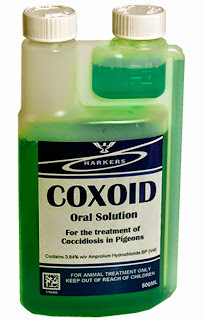 There is no point putting cured birds back into an infected house and a coccidial disinfectant will take care of any lingering coccidiosis parasites in your flock's coop. You should follow up any treatment of Coxoid with a multi-vitamin tonic to help your flock get back on its feet. This must be given after and not at the same time. It is entirely possible that your flock will live quite happily with a mild infection of coccidiosis their whole lives, however the regular use of an Apple Cider Vinegar will help make your hens guts 'inhospitable' to this microscopic pest. 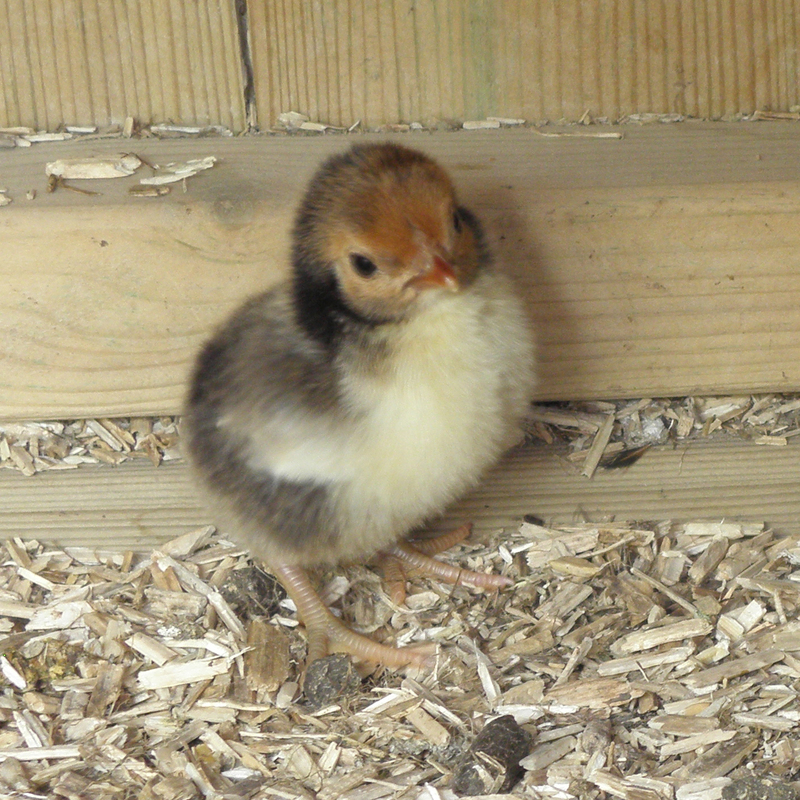 With a little care and if yoour information page all about Coccidiosis in Chickens HERE, leave a comment or call a member of our team on 01300 345229. Last week I wrote with some sadness how a recent power cut in our poultry paddock, let a fox break through our electric fence and attack our beloved cockerel, Sergeant Speckles. As many of you know, and thank you for the kind words we have received, Sergeant Speckles didn't make it and upon the power being turned back on and our electric fence running at full power once again, our poultry paddock is fully guarded. Foxes are becoming increasingly brazen in what they will do for a tasty meal of our beloved feathered friends. Both country foxes and their urban brothers are becoming more prevalent during the day and with cubbing season happening at the moment, the hungry mouths to feed at home only make them bolder. With this rise in fox activity it is an ideal time to check that your current electric fence is in tip-top order. 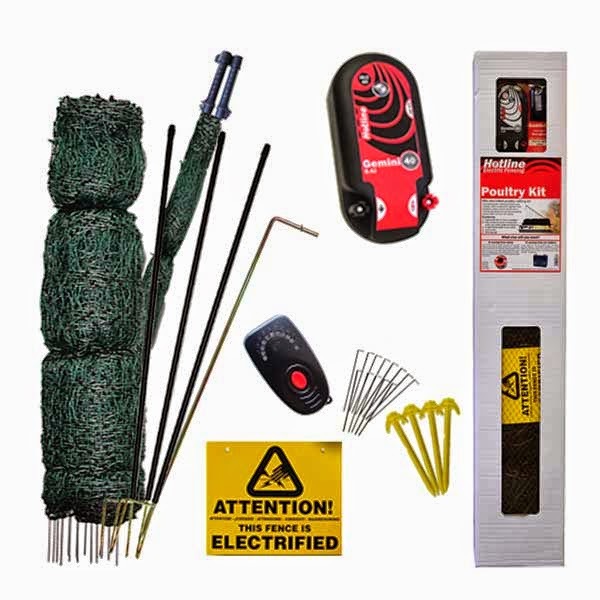 A little electric fence tester, like the audible key ring tester from Hotline, is a quick and easy way to tell you if your fence has power in it. Equally, the slightly more advanced LED fence tester will show you if you have 1,000 or 10,000 volts running through your netting. An electric net will ideally be running with around 3,000 volts passing through it. Handy ways to make sure your electric fence keeps Mr Fox at bay. New into Flyte so Fancy for 2015 are the Gated Netting Kits, coming in lengths of 16m, 25m or 50m. These kits contain everything you need, from corner posts, an earth stake and an energiser to keep your hens safe from predators. The dual power energiser in this kit allows for the poultry netting to be run off either mains power or through a battery, which gives great versatility in how you use the net. The new Gated Netting Kits also come with a separate Hot-Gate system to allow access into the pen. 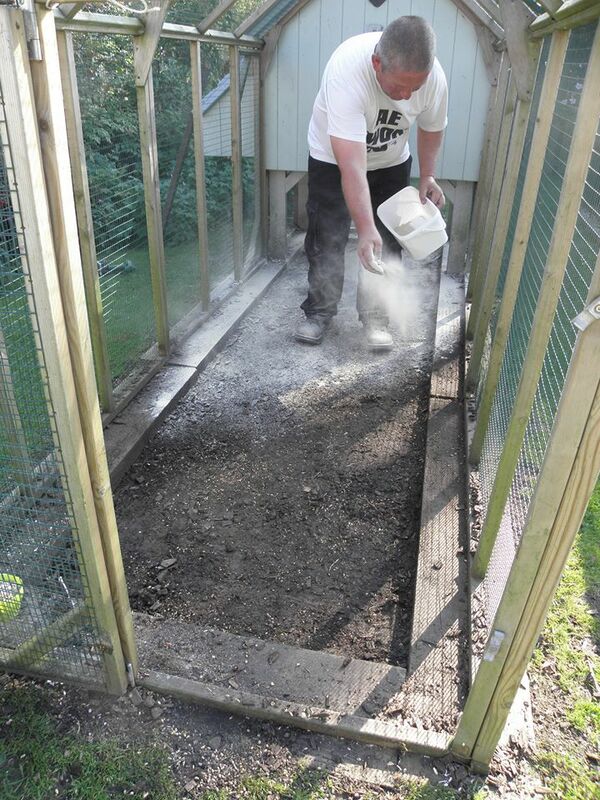 This means even if you are using your net in a straight line, as opposed to a circle or square, to block off the end of a garden, you can still put the gate into one end of the netting, to give you easy access into your hens. A very handy feature. Electric fencing is a great way to keep both your poultry safe and predators out. With the occasional checks and maintenance, and as long as you keep the net clear of surrounding vegetation and over-grown grass which will sap its power, electric fencing forms an effective barrier against foxes. Here at Flyte so Fancy we have had an electric fencing system protecting our precious girls and boys down in the chicken field for well over 7 years and it wasn't until a power cut a week ago, that we had our first major fox incursion into our chicken field. Electric fencing is a superb way to keep your girls safe while giving them some extra room to stretch their feathers. If you have any questions about electric fencing you can speak to a member of our team on 01300 345229 or leave a comment below. Here at Flyte so Fancy the chickens outnumber the staff at a ratio of about two to one. 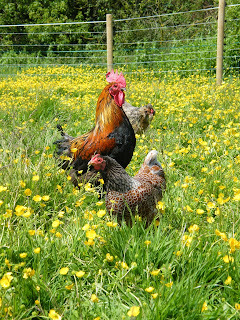 This is fine by us, especially considering the number of eggs that we get from the hard working hens, however it can raise a problem when introducing new hens into our peaceful flock. The introduction of a new chicken into an existing group can be a difficult time for your flock, readily leading to the new birds being bullied. With the onset of Spring and perhaps the inclination to "expand" your flock growing, this weeks Flyte so Fancy blog offers some advice on the best way to integrate new hens into your chicken coop. The traditional method involves being somewhat cunning and relying on your hens playing ball. If your flock is particularly placid, then one of the best ways to introduce new birds is at night after dark. Once your girls are on their perches, put the new hen into the chicken coop on the perches too. The result is that all the chickens wake up together, head out the pop-hole and go about the important business of finding breakfast. This is a simple and effective way to achieve integration. If you have a particularly bossy hen currently running the pecking order in your coop, then you might want to try a different tactic. One of the best ways to acclimatise chickens to each other is to let them see each other. 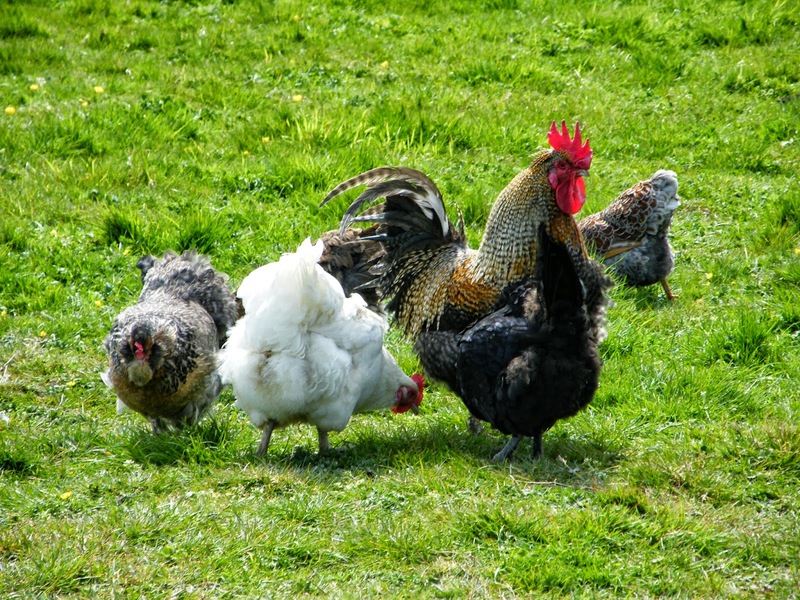 If you have a separate run or small hen house that you can place next to your existing one, or a place within your run with a small house you can fence off for a few days, this is one of the best ways to introduce a new hen, as after awhile the existing flock are completely used to seeing the new hens and don't think twice about them. 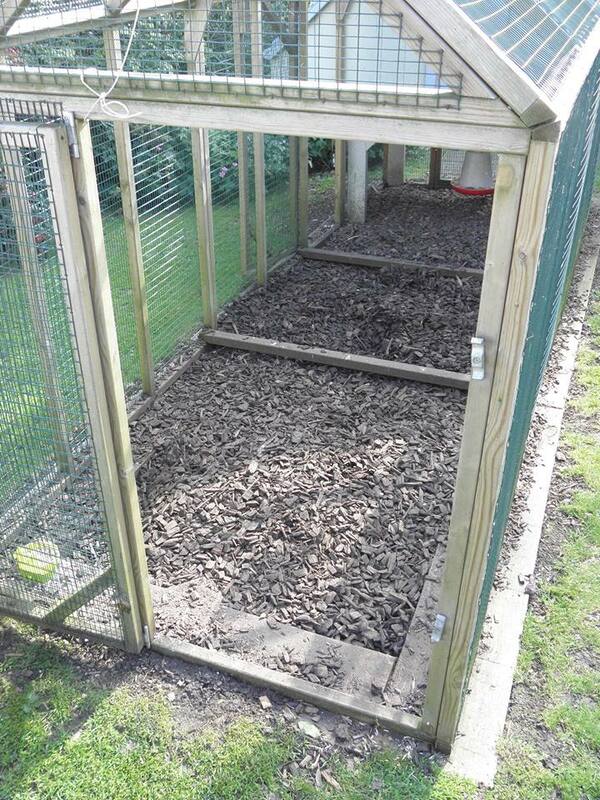 Make sure that there are plenty of refuges for a new hen to hide in should it need to. A few cardboard boxes with an entrance hole cut out make excellent temporary bolt holes which you can then remove and recycle. Increase the feeders and drinkers that you have in your run, so that your new hens will have access to food and water regardless of a bullying hen. Be sure to let your hens out early to avoid new hens and the existing flock being confined in the house and to stop any sort of argy-bargy that then might occur. If you have a bully hen remove her from the flock for a few days. She will lose her place in the pecking order and be re-introduced lower down the ranking. 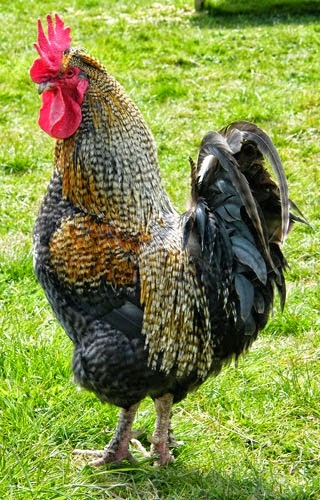 The bully hen is the problem, not the hens being bullied, so remove the bully. Following these few simple hints and tips means that introducing a new hen into your flock can be a simple and peaceful experience for you and your flock of girls. If you have any questions about introducing new hens in to your flock of chickens leave a comment below or call us on 01300 345229 to talk to a member of the team. As Sure As Eggs Is Eggs!!! There have been moments over the last few weeks where the sun, raising it's weary head over the Dorset Vale in which Flyte so Fancy is hidden away in, has shone down with all the warmth and cheer of a summers day. Of course this has been interspersed with days so cold and wet that I found every excuse possible to avoid going outside into the rain, even doing paperwork and filing! However cold it might be the days are slowly getting longer and the Flyte so Fancy flock have stretched their wings, ruffled their feathers and are getting back into the habit of laying eggs. Having such a large flock of chickens, ducks and geese it doesn't take long when they are all laying for there to be eggs everywhere. Here at Flyte so Fancy we have some great egg storage ideas, which not only keep your eggs safe for breakfast but also look fantastic in the kitchen. Shaped like everybodies favourite feathered friend, the chicken shaped wire egg basket, is the ideal place for storing eggs in the kitchen. Functional as well as charming, the egg basket can be wiped clean with a damp cloth. 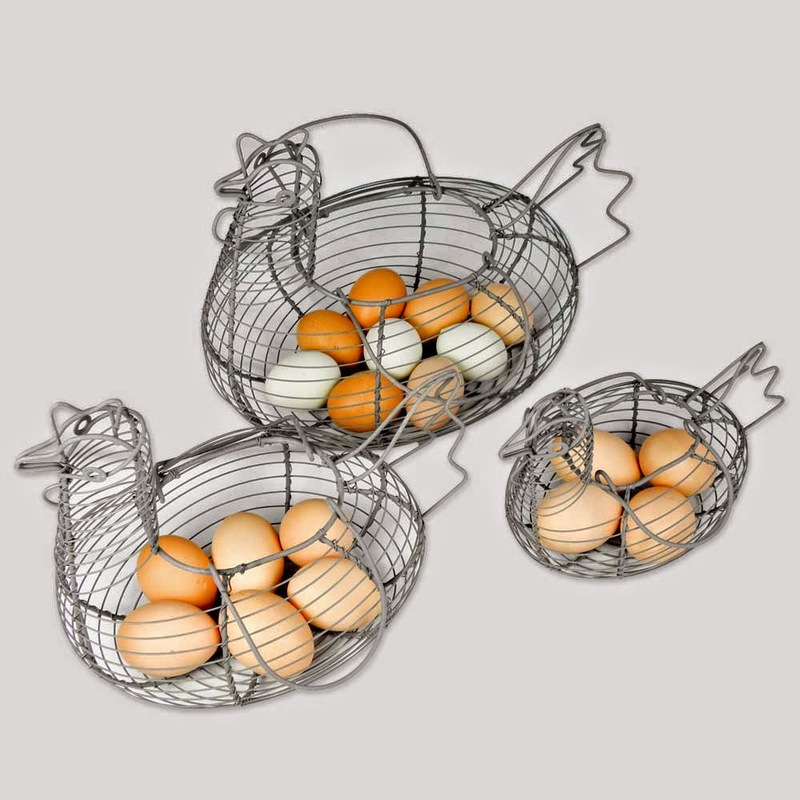 A brilliant gift for those who love hens, the chickens wire egg basket comes in three sizes, so even if your flock are working over time to give you more eggs that you can handle, there will always be somewhere to store them safe and sound. 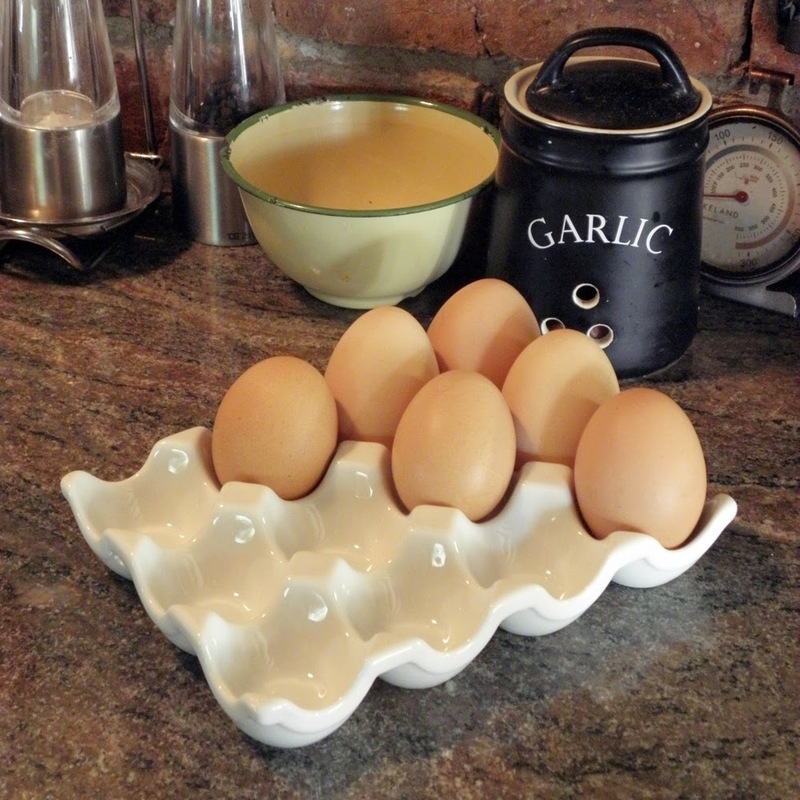 A lovely white ceramic egg tray for storing twelve large eggs, that really makes the colour of the eggs themselves a real feature of the kitchen. Both dishwasher and microwave safe, this is a classy alternative to cardboard egg boxes being piled all over the kitchen. 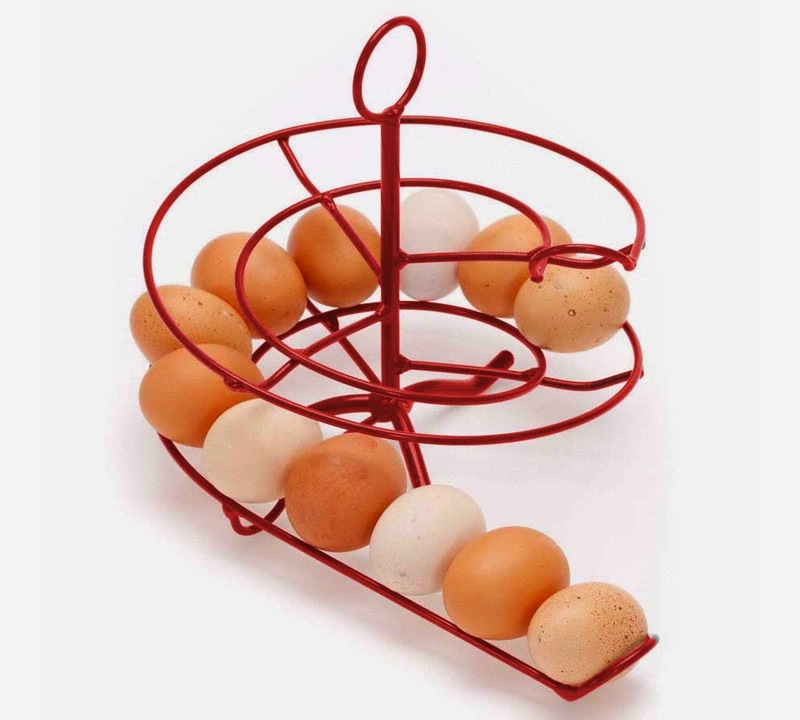 Shaped a like fairground helter-skelter, this charming wire framed egg run will hold up to sixteen eggs. Put the freshest eggs at the top and take from the bottom and your eggs will naturally cycle through as they are laid. 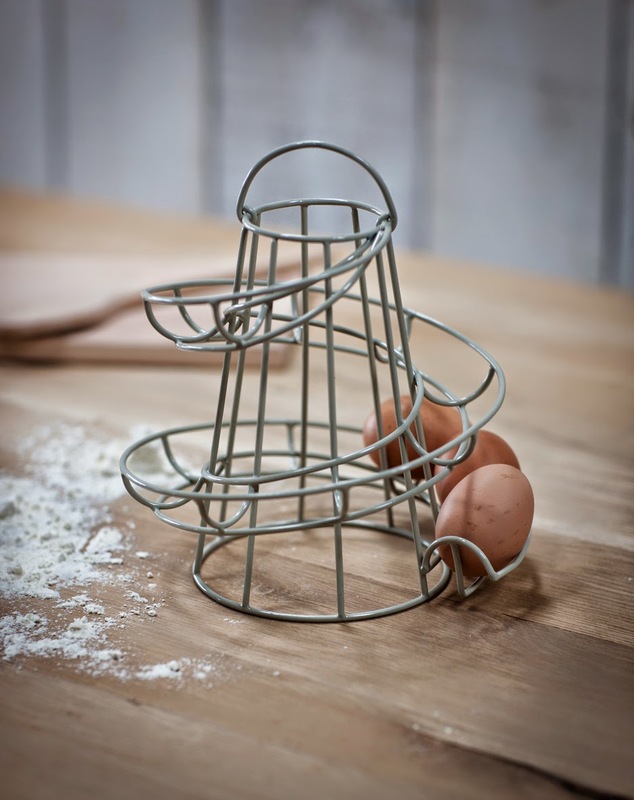 A brilliant feature of any kitchen, filled with rustic charm, the egg run comes in a choice of two colours, either Cornish Clay or Flint Grey and is a fun way to store your eggs. Of course, if your chickens are feeling particularly industrious, like our Flyte so Fancy flock, then you might need to choose function over style. Plastic Egg Trays come in a variety of colours and can hold up to thirty eggs, which can then be stacked upon each other to give you a skyscraper of eggs. Equally eggs don't need to be kept in the fridge, a cool dry larder or just on the kitchen worktop is just as good. The ever popular Egg Skelter will always be a great choice when it comes to storing your eggs and with a huge range of colours, including their Heritage colour range, there is one to suit any colour or style of kitchen. If you have any questions about storing eggs why not leave a comment below or call us on 01300 345229 to talk to a member of our team.